Most of the time on this blog I write about the pros and cons of various policy measures, independently of which individuals or parties are supporting them. But, of course, the U.S. President is the most important single actor on the political stage so it does matter immensely what the President thinks on any particular issue. The three biggest quagmires for Republican presidents are nativism, protectionism and isolationism. Where does President Trump come down on these major policy threads? Isolationism. Mr. Trump is not an isolationist. He is working with China and other Asian countries to contain North Korea. He is working with several Mideast powers to defeat ISIS. We have beefed up forces in Afghanistan to neutralize the Taliban. He has clearly backed down on his threat to withdraw from NATO. Protectionism. Unfortunately, Mr. Trump is too much of a protectionist. He is not against trade per se but he wants to replace broad multilateral trade agreements with separate bilateral trade agreements with lots of different countries. This will simply create an “insanely complicated mishmash of rules.” Instead he should focus on bargaining with China to get much better access for American products into Chinese markets. Nativism. Again, Mr. Trump (and many of his supporters) apparently doesn’t appreciate the enormous contributions which immigrants make to the U.S. economy at both the high end (skilled workers and entrepreneurs) and the low end (willingness to provide hard physical labor in agriculture, meatpacking, construction and personal care). Especially with our currently low unemployment rate of 4.1% we should take the opportunity to solve our illegal immigration problem by expanding our guest worker visa program. Conclusion. President Trump is clearly not an isolationist but smarter trade and immigration policies would help to speed up economic growth and create more jobs and higher wages for the blue-collar workers who are Mr. Trump’s main base of support. 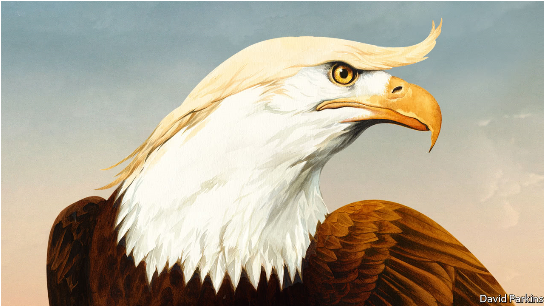 This entry was posted in Donald Trump, economic freedom, isolationism, Jack Heidel, nativism, protectionism, The Economist, Uncategorized and tagged Donald Trump, economic growth, isolationism, jack heidel, nativism, protectionism by jackheidel. Bookmark the permalink.